Goal setting, covered in Part A, is usually a part of joint planning in inter-organizational relations. It stands to reason that partners will sort out their common goals and the formal and informal governance mechanisms to achieve them. This happens through joint planning. Joint planning : the process of establishing partners’ roles, responsibilities, long-terms plans and contingencies, expectations, rules and procedures for sharing costs and benefits (a.k.a. distributive justice) and for resolving conflicts (a.k.a. procedural justice). Ideally, a constructive contracting process (Week 6, Part A) covers these objectives and fosters cooperation and trust at the outset of a relationship. Strongly linked to the supplier’s trust in the buyer firm (Johnston et al.,2004). A key success factor for alliances (Volery & Mensik, 1998). Capable of fostering a reciprocal and compounding relationship with inter-organizational trust that leads to improved performance. Influenced by and intimately connected to physical Transaction Specific Investments (Claro et al., 2003). 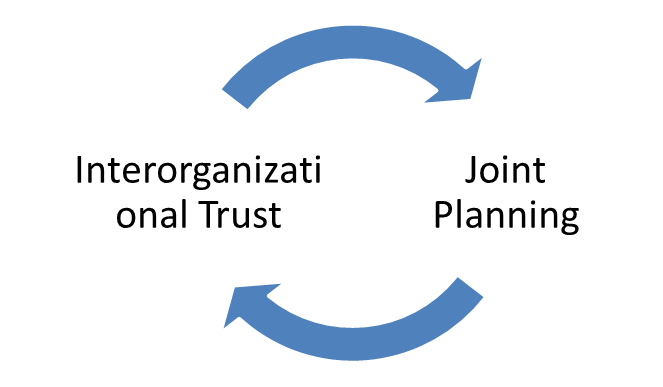 Just as we have seen with other trust building mechanisms, joint planning builds inter-organizational trust which, in turn, influences joint planning which reduces transaction costs by anticipating problems & reducing monitoring (Claro et al., 2003). Of course, in any partnership, there will be bumps in the road or unforeseen circumstances. How leaders address these challenges is critical in building and maintaining trust. It may also be a great source of innovation. Therefore, ensure that joint planning includes the creation of a fair process for joint problem solving. This is most easily done at the outset of a relationship, before any problems arise. Is a contributing factor to trust building, relational quality & consequently, better performance (Laan et al., 2011). Can prevent trust deterioration – as found in a 10-year business ethics case study by Bell, Oppenheimer, & Bastien (2002). Can harness “functional conflict” to build trust and create value. Is a source of goodwill and competence trust (Sako, 1998). A study by Mari Sako (1998) found that suppliers who spent more time in joint problem solving with customers have higher levels of goodwill and competence trust placed upon them. Again, we find that joint problem solving builds trust which, in turn, fuels the mechanism… it’s the generative quality of trust we discussed in Week 2. 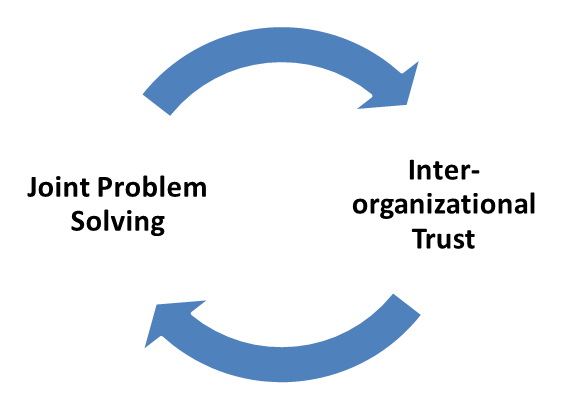 According to Danny Pimentel Claro, Geoffrey Hagelaar & Onno Omta in their article for Industrial Marketing Management (2003), joint problem solving is solely influenced by interpersonal and inter-organizational trust, implying that inter-organizational trust is an essential element for joint problem solving (Claro et al., 2003). So, for joint problem solving to work as a trust-building mechanism, partners should ensure they meet the needs of the other party (goodwill and benevolence) and to signal these intentions very clearly. The sooner you have the chicken and the egg, the better! Can you have either joint planning or joint problem solving without communication? What’s this about signalling? That’s the final direct informal governance mechanism we’ll look at later this week. Til then, any questions, comments, observations?